Some 27 years ago, a wild-haired, no-named animator/filmmaker made a short at Disney about a boy that brings his dead dog back to life a la Frankenstein's monster. The 30-minute film was deemed too dark for Disney's young audience and the mad scientist was fired from the Mouse House. Kind of ironic when you consider that no name went on to be Tim Burton, who has now turned his short -- Frankenweenie -- into a full length, black & white, stop motion 3D animated feature at ... yep, you guessed it ... Walt Disney Pictures! The film is very much a callback to that period in Burton's career, re-teaming him with Winona Ryder (Edward Scissorhands, Beetlejuice), Martin Landau (Ed Wood, Sleepy Hollow), and Catherine O'Hara (Beetlejuice, The Nightmare Before Christmas) and carrying the tune of his earlier, more gothic-inspired work. I got the chance to sit down with Mr. Burton, Mr. Landau, and Miss Ryder to talk about old friends and even older monsters. ScreenAnarchy: Tim, was there an experience with your own boyhood dog that influenced this story? Tim Burton: Well, that first relationship you have with a pet is so pure. And the dog I had had this disease called "distemper" and was not meant to live for very long and then ended up living quite a long time. So, in this special relationship there was always this specter of death hanging over it which, as a child, you don't really understand. Growing up with Frankenstein movies was my introduction to death so that's why it seemed like such an easy fit. It seemed quite natural to me! This film seems to be kind of a return to form for you, considering the 1984 short Frankenwenie was one of the first things you did before moving on to features. There's a lot of elements that call back to Edward Scissorhands and Beetlejuice, then of course reuniting with Winona. What, for you personally, was the reason to kind of reach back into the toy chest, so to speak? TB: Well, over the years it's been like memories resonating, you know? There were more memories from that time having to do with other kids in school, teachers, relationships you have with people and other kids, other monsters. We tried to make everything sort of personal that way. That's why I wanted to work with Martin [Landau] again, and Winona and Catherine O'Hara...people that I've worked with before because it was important to me to make this as personal as possible. Martin and Winona, what was it like working with Tim again after all these years? Martin Landau: This is so Tim ... the fact that he has kept this movie alive in his mind for all these years ... the one addition is the 3D but he would have made this very film 30 years ago if he could. I'm so happy he made this film. I love this film. And I wouldn't be here if I didn't! Winona Ryder: It was very special. Obviously, because it was so personal and working with Tim again. I really sort of drew on what I was like as a young girl. I also imagined what Tim was like at that age. That sort of shy, super creative kid. This film is really a love letter to that time and as Tim said that first relationship you have [with a pet]. It's as important to you as any relationship and it stays with you for the rest of your life. So, yeah it was really special. 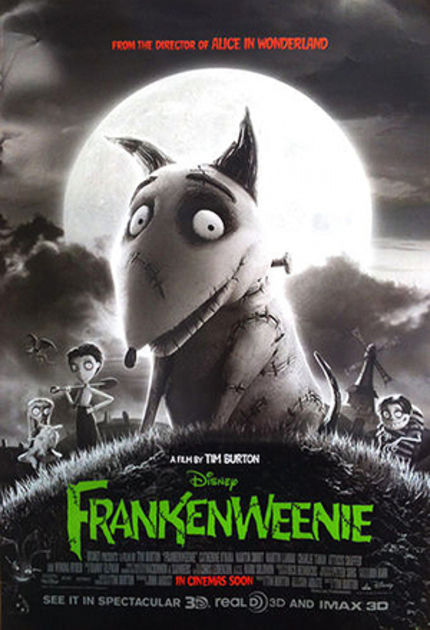 Tim, so many of your films are heavily influenced by the horror genre, especially Frankenweenie with all its homages to classic Hollywood monsters. Would you ever want to do a straight horror film? TB: I don't know. Because I have such a love of horror movies, none of them have ever really scared me. I'm much more scared by real life! So I don't know...I mean maybe. I just don't know what that would be. Frankenwenie is now playing in theaters across North America.